While both of these teams know that their Euroleague playoff spot is secured, there are still things for either side to play for. The hosts have a 17-11 record at this stage of the season and they are currently chasing down Fenerbahce Istanbul for the fourth spot in the table. The away side have a 21-7 record and they will be looking to take on Real Madrid and grab top spot in the table. This means that we should be in line for an exciting match on Friday night. These are two teams who have faced each other on a regular basis in the Euroleague, which includes playoff games, Final Four meetings and even Championship games. This may mean that there are no surprises when these players clash and meet but it should make for one of the most intriguing Euroleague clashes of the week. When these two sides met earlier on in the season, it was a very close game and the Russians came out on top by an 81-77 margin. It will be no surprise to learn that Nando De Colo picked up 20 points in that game, and Andrey Vorontsevich also provided 20 points in that fantastic win for the Russians. In this game on Friday night, the Greeks will turn to Nick Calathes, who has provided an average of 5.8 assists per game and Mike James who has offered an average of 12.7 points. KC Rivers has chipped in with an average of 10.9 points per game and the return from injury of James Gist will boost the hosts, as will the form of Chris Singleton, who has offered an average of 12.2 points per game. The away team will once again look to De Colo, who has provided an average of 20.2 points per game while Milos Teodosic has offered an average of 15.8 points per game and 7.5 assists per game. 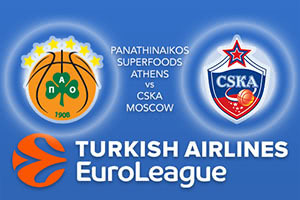 You can expect this game to be a close affair so back CSKA Moscow at -1, at odds of 1.90. If you’re looking for the Over/Under market, go OVER 157.0 at odds of 1.90. Bet Now!